The one, the only.........Bagged!.....Bottle Fed!......Thunderchicken!! 13.605 @ 99.46 & 13.608 @ 99.78 & 13.610 @ 101.72 on the bottle. TCCoA A-hole crew 2005 "DIASS"
why is there a different post on it?..is it going to be a tech article? What is a good connection to grab power from the parking lights for the powered indiglo guages? I am looking at my wiring schematic and I have a lead called "Illumination" in the harness that connects to the cluster but I am not sure if that is appropriate. The instructions specifically say not to connect these to the dimmer. doesnt the left harness on stock gauges control the function and then the other one controls the lighting?..my gauges moved when the left one was plugged in..but wasnt lit up..so then i re-connected the right harness a lot better then it light up..can you use that?.. Yeah, I think I can use that. Scott made my gauges. He did a good job, but the numbers are slightly blurry. Just watch whem you put them on to NOT use too much 3M sticky spray (if you choose to use it), it'll affect the lighting on the gauges. Oh yeah, don't drop your screws down into the steering column, it's a beast trying to find them! 96 pearl white 4.6 tbird: rebuilt npi block with pi heads, pi intake, crower stage 2 cams, shm high lift springs, L-MAF, 3.73's, marauder converter, jmod, kooks headers, xpipe, no cats, 2.5 in exhaust, no mufflers, a dyno tune, lots of interior work, 1 in drop with lots of new bushings, 18 in rims. 279 hp 319 tq. curently running 13.9 at 101 mph with a 2.1 60 time in 100 degree weather while having some nasty spark knock. Soon to have higher stall, aftermarket intake manifold, weight reduction, and hopefully a nice shot of the giggle gas. I thought they looked fine "as is" myself. ... not to mention the things with lights on them ... like cars and trucks. Bright dash lighting causes the eyes to restrict a little and the world "out there" doesn't seem as bright then, and it's easier to miss important stuff. Yeah, Dec 05? Wow, I hadn't looked at the dates. I got some of Scotts white face gauges, they look great and I dont have them on the car yet! Im going to have to try to do it myself but the instructions seem pretty straight forward. Im going for the driving lights and brighter bulbs too, have the wiring harness just need the bulbs. 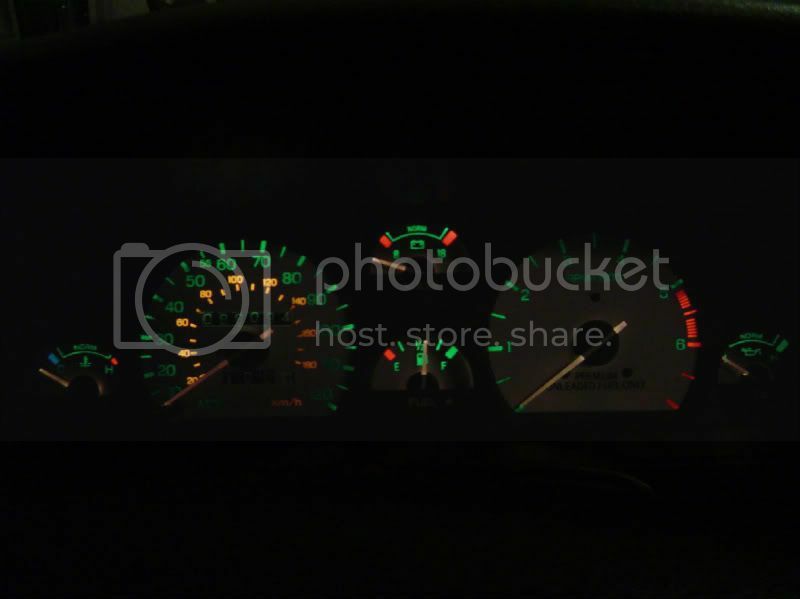 Too bad something like whats below wont work to light the gauges a little better. Im soure they can be used... but i dont have the knowledge on how it use them lol. I just put mine in the other day, they look great! thanks scott! only problem is i bought the LED strip and now i have no lighting to light up my gauges lol, it dont work or idk somethings wrong. Im going to check it out later. does anybody know what wire to test behind the gauge to see if i got power going to light up the gauges? Just unplug the LED strips socket and turn the plug 180 degrees and plug it back in. That should fix it. yeah thats exactly what scott just told me, im going to go do that now. thanks for the reply! I got them working now, there awesome! they light up everything really bright. thanks alot scott i really appreciate it. now here are some night pics after i got them working, they gauge surround was not on it yet so you can see light around the edges. this is with scotts LED strip. Woah that's bright man. I'm not sure if I could drive at night with all that light. I should be able to get mine in by this fall, lots of stuff going on with the Bird right now. I just recieved my 200 mph gauges today! Just kidding. Theyre 200 kph white faced overlay guages. 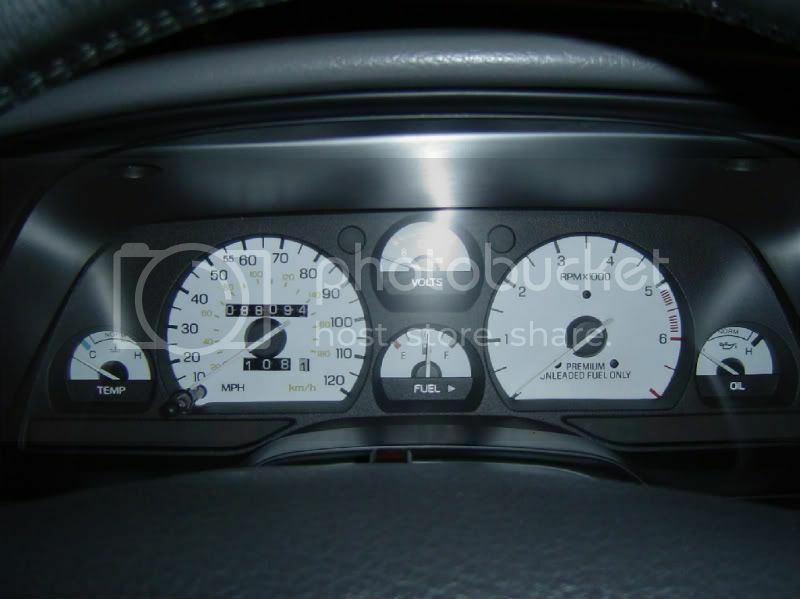 The mph numbers are the smaller numbers that are in the original spots as the numbers on the stock gauges so there's no recalibration required. At first glance you would swear theyre 200 mph gauges though becuse the mph/kph letters are on the opposite sides of where they should be. Was wondering if I could just peel off the stock black faces and lay down the whites to change the color of the numbers with different colored bulbs instead of sanding the green paint off the back of the black faced ones. Anyone know? Yeah they look somthin like stickers. According to the instructions it talks about peeling off the backing of-em and using soapy water to get-em to stick on top of the existing guages. It didnt mention that in the ad. I'll just remove the black faces, peel the backing of the new ones off and lay-em on there. It's not a good idea to use colored bulbs especially LED's in the cluster. That will make everything in the cluster the color of the bulbs. If the faces are clear and you want a specific color what I use is lighting color gels. They are for photography to put over the lights to achieve different colors. I have a link in here somewhere for them or you can check on Ebay. It's just a very thin plastic that comes in a variety of colors, you could cut them to fit the faces and just put them behind the faces. I got the latest ones I have at an actual photography shop in Tempe, they are 12 inch by 12 inch squares and are actually the exact blue I was looking for. I forget how I did it but it took me a long time searching to find the right blue that matched the blue LED's I was buying. I'm in Utah right now though so can't take a picture and don't know the name of them. Last edited by BlueEyes; 03-09-2012 at 11:54 AM. Mods-- CAI (Fabricated by me), Speaker system, 20% Tinted Windows, Dual Exhaust, Strut brace, and two Rear braces one in my trunk and one underneath the car where the exhaust Y's out. Hopefully a lot more to come. His name is Scott, check out the examples and shoot him an email, he can do a lot of personalized custom things too. Last edited by XR7-4.6; 03-14-2012 at 10:53 PM.